Keeping your commercial or residential property looking its best can be a challenge. When you spend the time and money on the upkeep of your landscape you want everything to look perfect. Tree stumps leftover from previous tree removals can be unsightly and can be removed to preserve the natural beauty of your property. Porter Tree Services has years of experience in stump grinding. We take pride in our work, and that can be seen in every project we undertake – no matter how big or small. 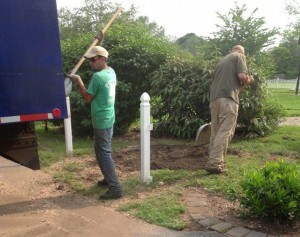 When it comes to stump grinding, our crews are professional and experienced. At Porter Tree Services, we treat every customer’s property as if it were our own. 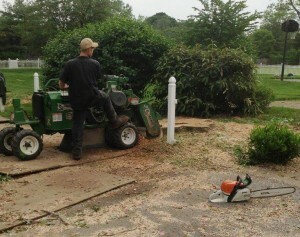 We carefully prepare the area before starting the stump grinding. The equipment we use is carefully monitored and operated by our professional crew to maintain the existing trees, bushes, and landscape features. After the stump grinding is complete, we clean and haul away all leftover debris. The void left by the stump hole is filled with topsoil, planted with grass seed, and covered with straw. Our customers are left with a newly seeded turf area. Trust your stump grinding needs to a professional company. We take pride in our work and so will you. If you have questions about our stump grinding services, or would like to schedule a site visit, please call us today at 410-882-TREE (8733).